Annual Migrating Gray Whale Body Condition Assessment — SR3 Sealife Response, Rehabilitation, and Research improving the health of marine wildlife. SR3’s Dr. Holly Fearnbach and her colleague, Dr. John Durban from NOAA’s Southwest Fisheries Science Center (SWFSC), just completed their 4th consecutive annual assessment of the body condition of gray whales migrating past Piedras Blancas lighthouse in central California. Each spring, gray whales migrate northwards along the coast of North America from breeding grounds off Mexico to feeding grounds in the Arctic. The team flies an unmanned octocopter from shore to collect high-resolution vertical images of these gray whales as they migrate past. This year, they obtained images of 34 gray whale female/calf pairs and 3 juvenile gray whales, adding to the 200+ pairs they have flown over in the previous three years. The body condition of mothers, and the growth and condition of calves, will be evaluated by measuring length and breadth profiles along the body axis. Measurements will be compared between and within years to elucidate trends in patterns of growth and condition. Now Holly is off to San Juan Island for a month-long aerial health assessment of the endangered population of Southern Resident killer whales. More updates to come! 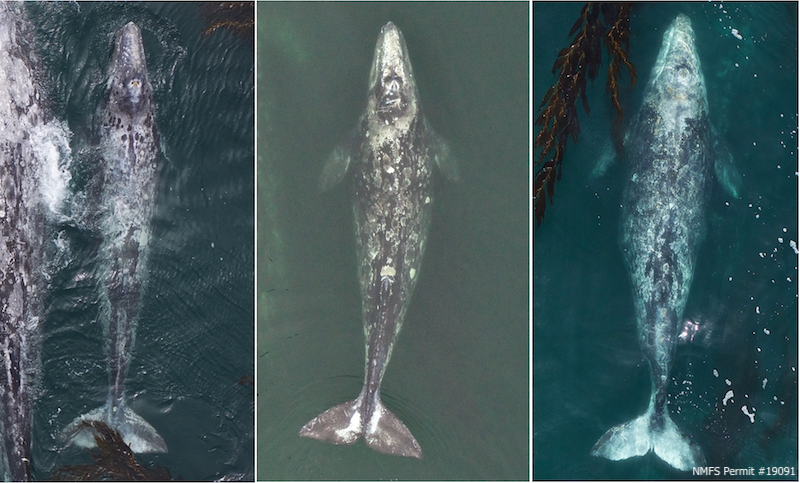 Aerial images of three gray whale calves, migrating north past Point Piedras Blancas, CA, ranging from lean body condition (left) to robust (right). Photos taken from an unmanned octocopter ~170ft above the whales, with flights over whales authorized by NMFS permit #19091.